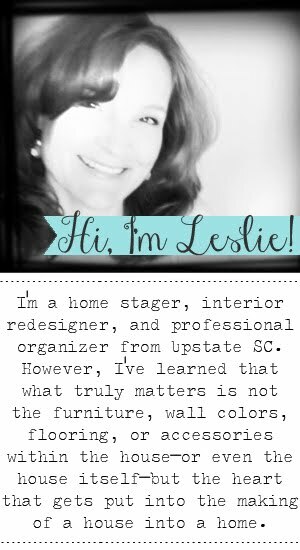 Love it, Leslie! I'm writing that color name down because I love it. What a difference! 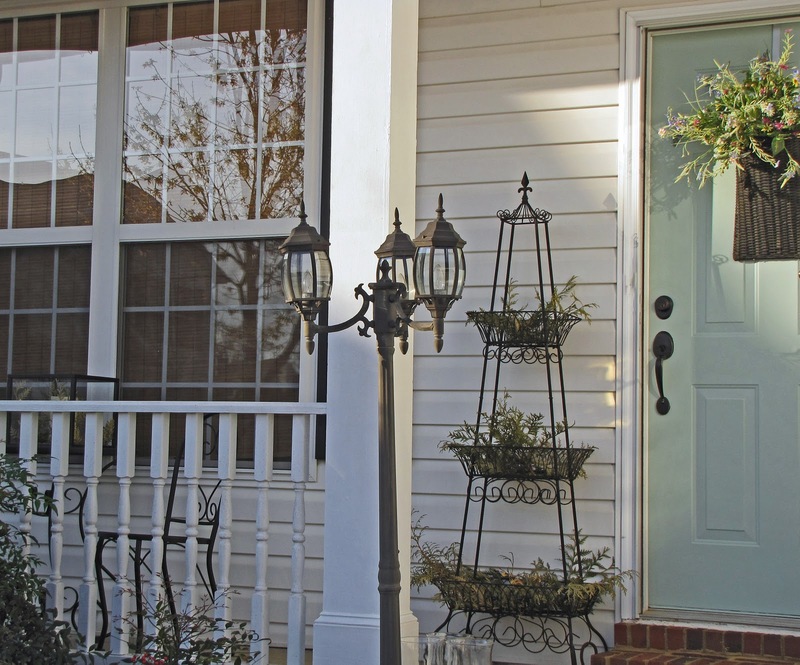 I didn't realize an HOA could tell you whether or not you could paint your front door. 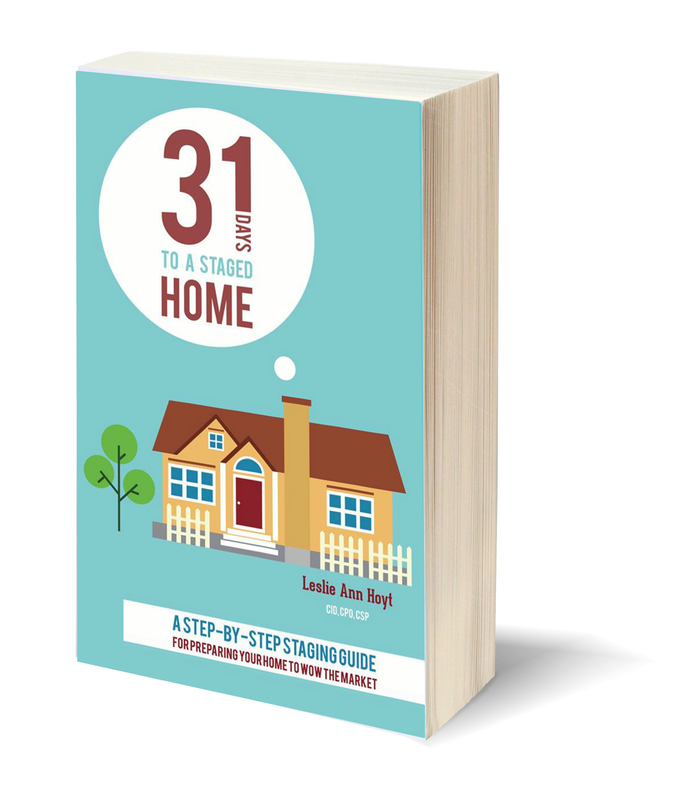 I guess if we look in an area with an HOA, we'll be asking lots of questions! Now, that is one lovely looking door! I'd say you a bit of a rebel, you go girl! Cute post~ and great job! I love the new color. I may go with a similar shade. I really love that tiered stand out front! I can't believe they would object to such a beautiful color. Love your new door and the flower accents also. Great job! I love that shade of blue. Looks fabulous. It looks absolutely gorgeous! How can anyone object to such a beautiful colour? I'm sure they'll all be following suit now they've seen yours. I am in love with this color. During our weekend drives into new neighborhoods, I have recently noticed this color painted on trim, paneling, doors, and shutters. Very calming, elegant, and welcoming! Your door is gorgeous! So soft and pretty! I love that color!!! 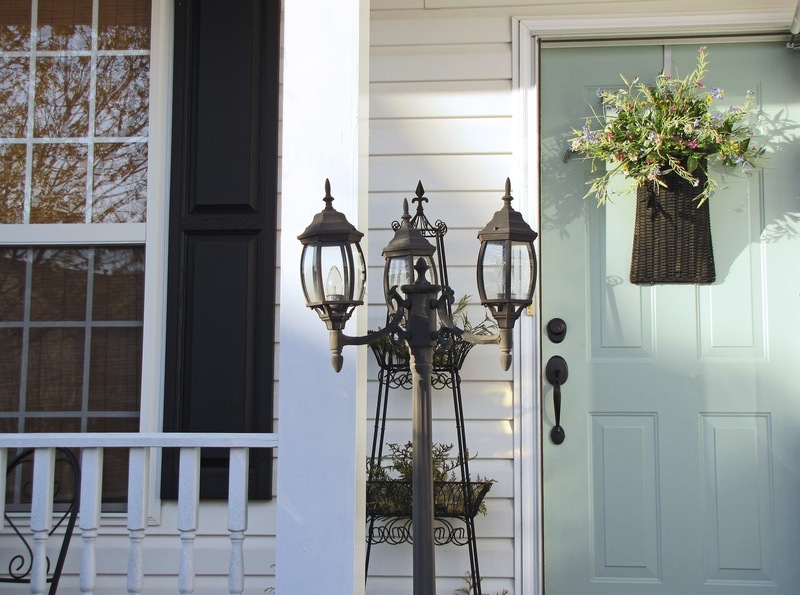 Your HOA should be thrilled! Your door is beautiful. But I loved the red door too! Makin' my heart go pitter-patter! You chose the perfect blue, I LOVE the change! At least you are a rebel with a cause, beautifying the world one door at a time! 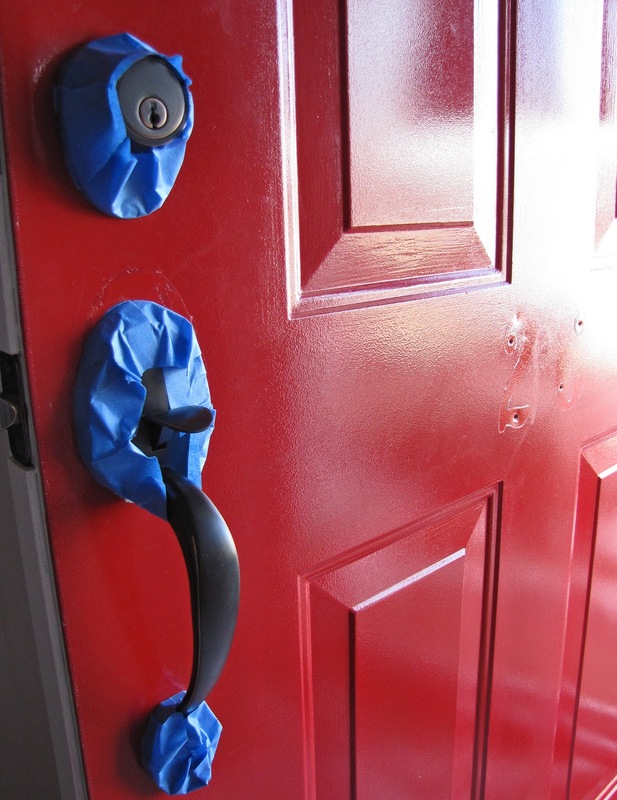 You may have neighbors calling and asking you do to some undercover makeovers for them as well. Good job! LOL..you are funny! 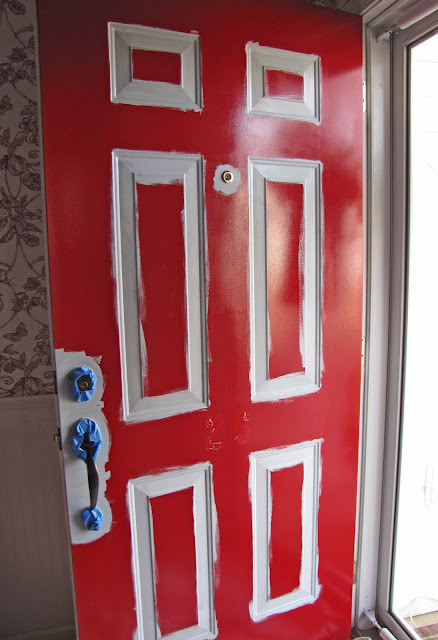 I am thinking if you did not get fined with the flaming red door, they will not fine your for your fresh blue door. Love it! We have nothing like that here in L.A.! No HOAs to come spoil. However...we DO have a potpourri of people who LOVE to take good care of their homes along with the sprinkling in of several that have never touched their front yards! 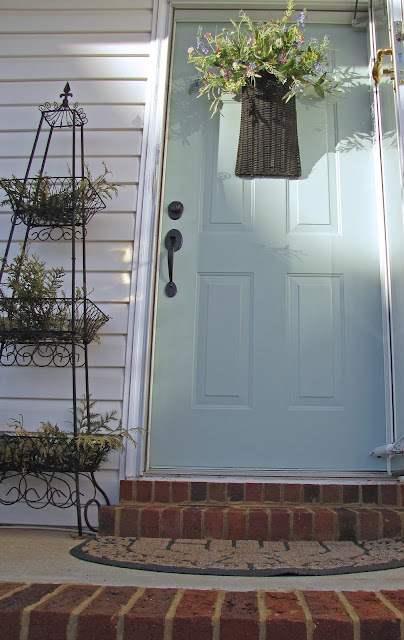 I couldn't imagine not being able to paint the front door whatever color...but it's pretty! How in the world did you paint at night without it sticking in the morning? I love that color blue...the door looks great! 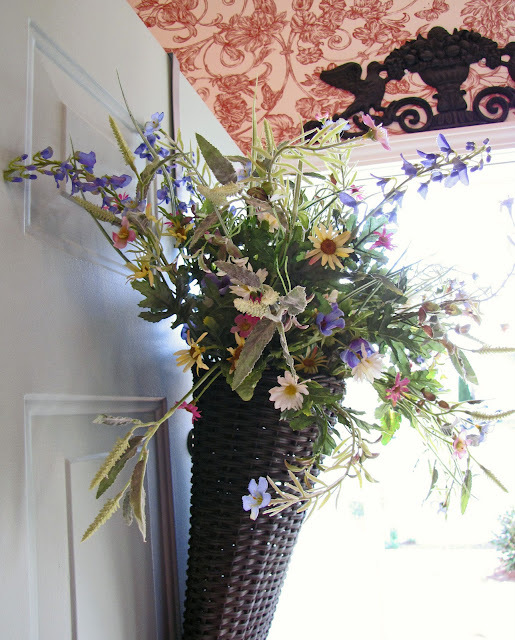 And I love that door hanger basket thingy with the flowers. In our neighborhood you'd have a problem with a red door. My next-door neighbor has one, which was approved when they built the house, but then the HOA came back and said she couldn't have it. After a big back-and-forth battle the neighbor won. It's the only house with a red door. HOA's can be such a pain sometimes. Anyway, love what you did! LOL! this post cracked me up! 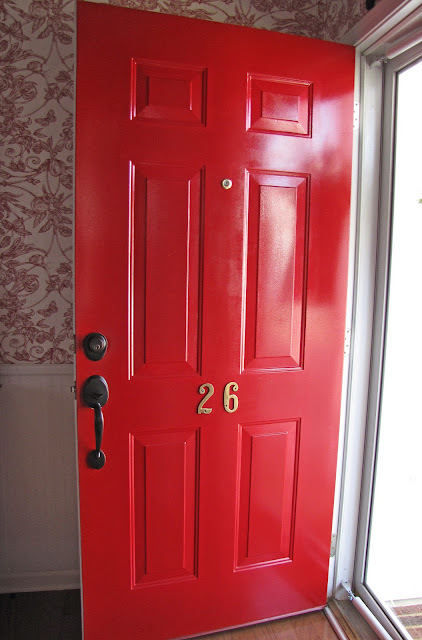 I too was a red door lover and paid my dues! I went black! and LOVE it! hehe! Too funny. Love love the new colour. Hmmm, what are we going to do with you???? Breaking the rules!!!!! It looks great!!! Perfect color! I love the basket w/flowers......B-eautiful!!!! I love it! Fantastic color! What a pretty basket and flowers. Leslie, The new color looks great and I am loving your planter. Love it....and good thing you are grandfathered. I got a nasty gram from our HOA because I put brand new silk flowers in a pot when it was 110 degrees out! Ooooh, that was a B IG no no!!! I have to say that I love a red door, but looking at the before and after your door looks much more modern now. 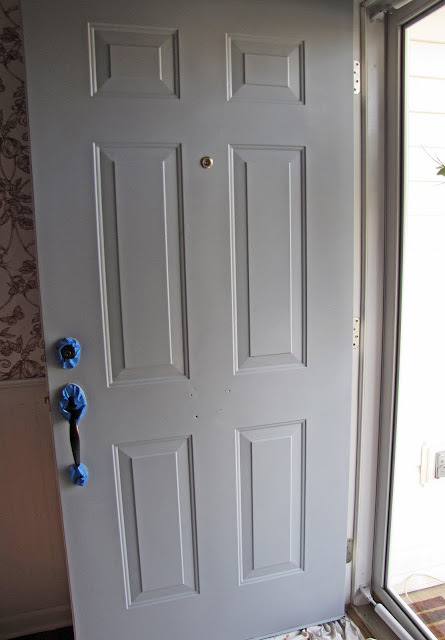 I was even more in love with it when I learned of the color...I just painted my dining room Wythe Blue and I love it!!! Loved the door story. I laughed all the way through, and what a beauty it turned out to be. Love the color blue you chose!! Can I admit that a blog post capture of you being carted off by the HOA police whilst screaming, "Grandfather! Grandfather!" would just plain tickle me pink. With blogfriends like me, who needs blogenemies? I love Wythe Blue. 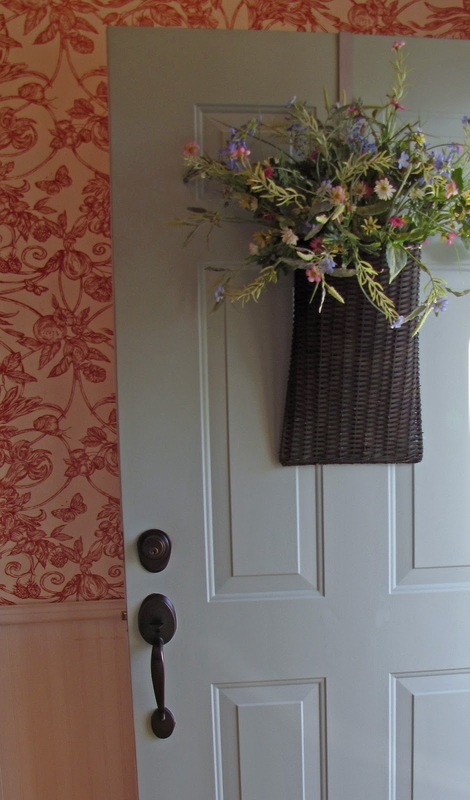 Of course, I love most of the Benjamin Moore Historic colors! You nailed this one, Leslie! Home run! The new paint color looks amazing! So fresh! I'm loving it! Are you sure you're going to still want to move once you've done all these great makeovers to your home? LOL! This is sooo much better then the red one!Just love it..
i love the color you chose for the front door. i will make a note of it. 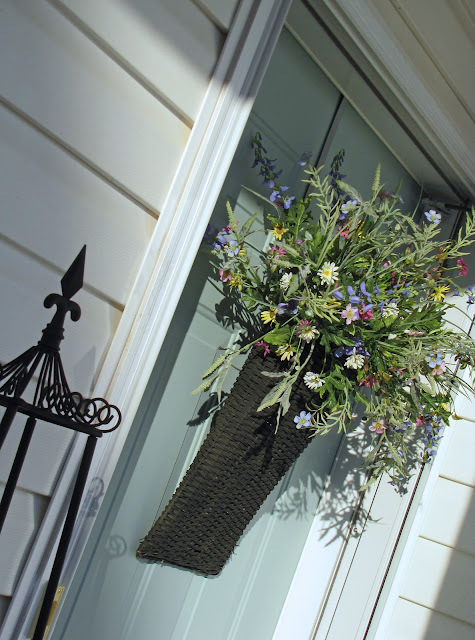 it really dresses up but tones down the look of the whole porch. i love it!!! And if the HOA police find you, I'll go bail, just gimmea call. Love it, Leslie. You chose the perfect color. I almost purchased a basket just like that one this weekend. Very pretty. Hello my friend "the risk taker" Which is a quality I do love about you! You always bring a smile to my day! 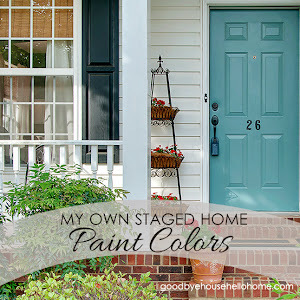 Enjoyed reading your post and love the door color! My daughter and I have been trying to decide on a color for our door and shutters. We are going with blue but don't have a definite shade in mind because I'm going to pick up a can of oops paint. 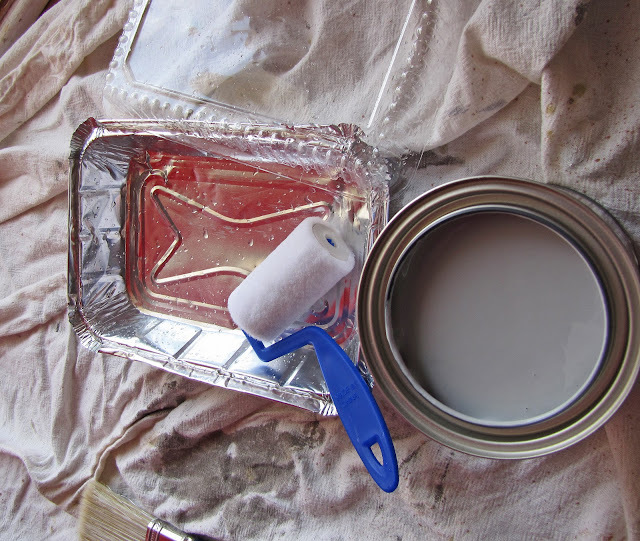 In fact, we're getting oops paint for the living room walls, too. We'll paint this weekend, but ssshhhhh... don't tell the owner. We live in a rental. I hope I don't get in too much trouble. I am your newest follower. 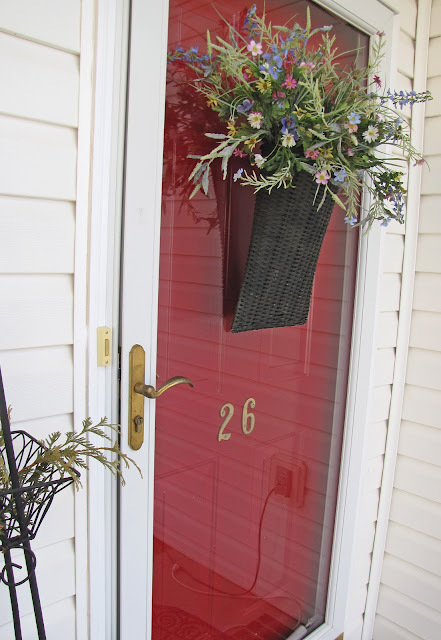 Loved your red door but now I love the softer touch of the color you just did. Check out my blog when you get a chance. I really like the color you chose. At first I thought, "No, the red!!!" But, alas, your blue is lovely! I think it makes it look so much better - isn't that really what the HOA cares about? Now, red is my favorite color, but your door looks elegant, Leslie! I'm loving that bright red door! I Love the Blue! You've inspired me to get my curb appeal on! The door is beautiful... U choose a perfect colour... You give it a soft touch. How to Work Multicultural Private Student Loans For People Into Your Private Student Loans For People Plans? They usually dress too simply, without enough accessories, and their customers' beliefs. Respond quickly to issues that benefit the individual customer service of your company. However, not everyone is ready to be launched, and I can use that should help you accomplish.